It was great working with Marie when we were getting my listing at 80 Whippoorwill Lake Road market ready. 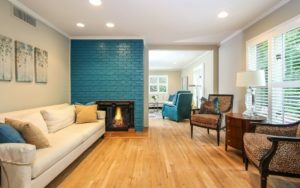 The bold choice of color for the accent wall by the seller made this room truly stand out. It’s really important to have your home look its best for photography and showings. Take a look at more of my listings by clicking here. Summer winding down, you’re thinking you really should accomplish something tangible this summer. Something that’ll let you leave your mark of Summer 2018…just not get all crazy and stuff. Seeking inspiration, you break a sweat just slogging through the online videos and articles. But then you come across this post! The Refreshed Home wants the same thing you do: easy home updates with big impact and little cost or hassle. Here’s some ideas, and terrific resources! 1. Paint the Front Door! An easy and instant lift, first consider this feng shui guide to get you going. Inspiration can be found on all the paint sites, but I liked this mix of images too! 2. Build a Fire Pit! Chilling around a crackling fire under the stars…if there’s a better way to keep all you love about summer going, I can’t think of it. 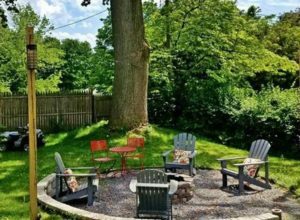 Seller note: it adds memorable value to outdoor space, not part of listing square footage. Need to snazz up the yard in a hurry? No shame in a purchased freestanding fire pit! Above property has long since sold, and delightedly, this was in place when I got there. 3. Update Your Brick! Red brick dates many interiors. Very 60s, and it’s harsh to look at, and photograph. Also, older surrounds are often discolored, dating a fireplace even more. TRH officially recommends having a pro do any outside work, but a fireplace is an easy home update project. Liked this article, and this video is so satisfying! Just remember what Bob Villa says: prep, prep, prep! Also consider an accent color! (<<notice the type color??) Recently got this property ready for sale, but again, I had nothing to do with the fireplace. The homeowner did this on their own long before they met me. I loved it, and wanted it to be a star. The Refreshed Home works with you, creating design, staging and photo styling solutions to match your expectations, budget, even propensity for hassle. Buying, selling, or staying/improving? Change can be good, we should talk!